OK, so now you know my favorite drink at "4 Bucks"! That's right, Sir Hook was granted the estate and all its privilege of a Free Venti Latte all week with the title of Customer of the Week. The only problem is, I won't be here all week. This road weary warrior must once again mount his silver steed and roar away into the heavens. The plus, I'm going to Clearwater, FL. Serious, it's business. Of course I always make fun my business! So once again I leave you in the capable hands of Sir Bowie of Greenbriar for daily words of wisdom. But, before I go I must share what you can find in the world of Diversity while hanging out at Starbucks. Here it is in living color, and I kid you not, they were both in at the same time. I couldn't believe my good fortune and belly laugh (Sorry for using these innocent people, but give me a break!) Ladies & Knights, meet "The Virgin 05" and "You Can't Beat Our Meat". Truer words have never been said, or for that matter, worn! 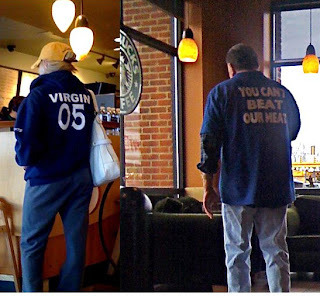 So the next time when you are in Starbucks fantasizing about Virgin's, remember, You Can't Beat Our Meat! Or, I should say, they won't beat yours! Here's to Unity through Diversity in all its splendid and glorious forms.